Definition at line 106 of file name-tree-hashtable.hpp. Definition at line 112 of file name-tree-hashtable.cpp. Definition at line 119 of file name-tree-hashtable.hpp. Definition at line 123 of file name-tree-hashtable.hpp. 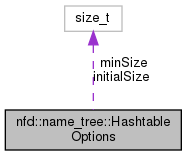 Referenced by nfd::name_tree::Hashtable::erase(), and nfd::name_tree::Hashtable::Hashtable(). Definition at line 127 of file name-tree-hashtable.hpp. Definition at line 131 of file name-tree-hashtable.hpp. Definition at line 135 of file name-tree-hashtable.hpp. Definition at line 139 of file name-tree-hashtable.hpp.